According to the United Nations, less than 30 per cent of researchers worldwide are women. UNESCO data tells us only around 30 per cent of all female students select STEM (Science Technology Engineering Mathematics) related fields in higher education. DUG recognises the importance of representation and visibility. To mark International Day of Women and Girls in Science we talk to some of the brilliant women that we are fortunate enough to have working with us. 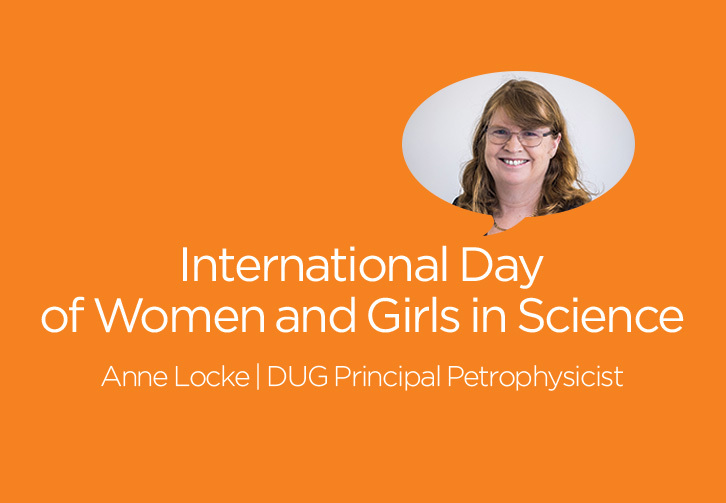 Petrophysicist Anne Locke has been with DUG since the beginning 15 years ago, when co-founders Matt Lamont and Troy Thompson asked her to head up petrophysics — the study of the relationship of physics to rocks. Part of her work, Anne says, is to carry out petrophysics and rock physics studies for the company, as well as interpreting data collected while drilling exploration or development oil/ gas wells. Anne also volunteers with the Innovators Tea Party, a not-for-profit organisation that aims to inspire and empower more young women to pursue careers in STEM. “I think it is very important for all young women to know that they can do anything that they work towards,” Anne says. Visibility is important. Women in science throughout history tend to be big innovators, Anne says. “They are often lateral thinkers who think of very different ways to solve a set of problems. Anne also volunteers her time as a Girl Guide Leader. “It’s important to teach girls that they can do anything in life,” Anne says, and that the organisation gives girls many different opportunities to try things they normally wouldn’t have the chance to. “When I started at DUG 15 years ago I had 2 children at school and had just moved to a new state,” Anne says. “DUG allowed me to work flexible hours, so I could be there for my children when I was needed. I could still get my work done at hours that suited me, not necessarily 9-5. “DUG has been very supportive of women from the time the company was first set up. DUG has recognised that there are many women with amazing skills, who find it difficult to work 9-5, 5 days a week due to family commitments. Because of this support, DUG have a higher than normal ratio of women in very senior positions in the company.